Bacteriophage lysins are murein hydrolases that act on the cell wall of host bacteria to release progeny phage. Research indicated that lysins can kill bacteria efficiently and specifically in vitro. The streptococcal phage lysin, PlyC, was found to lyse streptococcal species rapidly. The catalytically active PlyC holoenzyme is composed of two components, eight PlyCB subunits for each PlyCA. We cloned the two genes plyCA and plyCB which encoding 465 and 72 amino acids respectively and inserted into prokaryotic expression vector pET-32a (+) to construct the recombinant plasmid pET32a-PlyCA and pET32a-PlyCB, transformed into E. coli BL21 (DE3). The recombinant PlyCA and PlyCB expressed in the form of inclusion body, they were renatured by dilution and dialysis. After separating and preliminary purifying, inclusion body PiyCA and PlyCB over 80% purity were dissolved in 8 mol/L urea separately, then diluted or dialyzed into 0.8 mol/L urea. Research showed that dialysis by gentle removal of urea against 5 mmol/L sodium phosphate buffer (pH 6.1) with redox agents, protein concentration of 50 μg/ml and temperature of 4°C was found to be optimal. The maximum enzyme activity was observed at pH 7.0, 40°C. The results showed that the renatured PlyC could efficiently cleavage Streptococcus pyogenes (group A β-hemolytic streptococci). This study laid the foundation for the further study and achieving an effective treatment for streptococcal infection. Bacteriophage lysin of Streptococcus, PlyC, Recombinant, Renaturation, Characterization. Bacteriophage lysins are murein hydrolases which can specifically and quickly destroy the cell wall of the host and release progeny phage , consequently, they have potential as antibiotic agents. Streptococcus pyogenes (Spy, group A streptococci) is a leading cause of infections of the mucous membranes and skin and is becoming increasingly antibiotic resistant worldwide [2,3]. Researchers have found that bacteriophage lysin of Streptococcus (PlyC) can rapidly lyse cultures of groups A and C streptococci and has improved to be a novel therapeutic for the control of pathogens [4,5]. As PlyC is composed of two separate gene products, PlyCA and PlyCB , we constructed the recombinant plasmids pET-32a(+)-PlyCA and pET-32a(+)-PlyCB and transformed them into the host E. coli (DE3) respectively . It has been shown that the desired proteins are expressed as inclusion bodies. Expression of recombinant proteins as inclusion bodies can be advantageous to achieve the high levels of protein produced and can protect them from proteolytic degradation. So expression of recombinant proteins as inclusion bodies in bacteria may be an efficient way as long as they can be successfully renatured. Dilution, diafiltration, dialysis, or a desalting column is usually used for this purpose [8-10]. In this paper, we refolded the protein by the means of diluted or dialyzed, optimized several processing parameters such as buffer type, pH etc. The results indicated that the renatured PlyC could efficiently cleavage Streptococcus pyogenes. This work made a favorable basis for further research. The recombinant E. coli BL21 (DE3) containing the recombinant plasmids pET-32a(+)-PlyCA and pET-32a(+)- PlyCB respectively were constructed by our lab. Streptococcus pyogenes (group A β-hemolytic streptococci) were gifted from Zhejiang provincial center for disease prevention and control. Ultra-pure urea, oxidized and reduced glutathione (GSSG and GSH), isopropyl β-D-thiogalactopyranoside (IPTG), ampicillin, Tris and Ethylenediaminetetraacetic Acid (EDTA) were purchased from Shanghai Sangon Co. Ltd., China. All other chemicals used were of analytical reagent grade. Vertical electrophoresis apparatus, Mini-PROTEAN 3 Cell, made by Bio-RAD company USA; Gel imaging system, Molecular Imager Gel Doc XR+, made by Bio-RAD company USA; High-speed freeze centrifuge, EPPENDORF, made by EPPENDORF company USA. Sonication apparatus, YT92-II D made by Biological Technology Co., Ltd. Ningbo China. Escherichia coli strain BL21 (DE3)/pET-32a(+)-PlyCA and BL21(DE3)/pET-32a(+)-PlyCB were cultured in 2X YTampicillin (100 μg/ml) medium (200 ml)at 37°C to an optical density at 600 nm of 0.4~0.7, then included at 30°C, with isopropyl β-D-thiogalactopyranoside (IPTG) at final concentration of 3.0 mmol/L. Cells were harvested by centrifugation (10000 g, 10 min) after 19 h of induction and suspended in 20 mmol/L Tris-HCl buffer (pH 8.0). The cell suspension was then subjected to sonication for disruption and centrifuged at 10000 g for 10 min to isolate inclusion bodies from cell debris. The inclusion bodies were washed by detergent buffer (pH 8.0) containing 20 mmol/L Tris-HCl and 2.0 mol/L urea four times. Finally, the pellet was washed by distilled water once time to remove contaminating detergent and then stored at -20°C until used. Protein samples were analysed by sodiumdo decylsulphate polyacrylamide gel electrophoresis (SDS-PAGE). PlyCA was electrophoresised by 12% separating gel and PlyCB was electrophoresised by 15% separating gel. Stacking gels and separating gels were showed as Table 1. Table 1. Sodium Dodecyl Sulphate (SDS) polyacrylamide gel electrophoresis protocol for the preparation of the polyacrylamide gels. Each sample was suspended in sample buffer (200 μL) containing 2% (w/v) SDS, 10% (v/v) glycerol, 0.01% (w/v) bromophenol blue, 5% (v/v) 2-mercaptoethanol and 0.5 mM Tris-HCL (pH 6.8). Then, they were placed in a boiling water bath for 10 min and allowed to cool and were put in an Eppendorf microcentrifuge for 10 min at 12000 g. After centrifugal use 15 μL from each sample were loaded into each slot of a precast Vertical slab gel electrophoresis unit with 10- well combs, and loaded low protein molecular weight marker (8-81KDa, purchased from Zhong Ke Rui Tai Co. Ltd, Beijing china to compare with sample proteins. The running buffer was containing 0.025 mol/L Tris base, 0.19 mol/L glycine, 0.1% (w/v) SDS, pH 8.6. The gel was run at 80 V until samples were stacked, then run at 120V until the dye front reached the bottom of the gels, then, SDS-PAGE gels were fixed for 30 min in staining solution containing 0.5% (w/v) Coomassie R-250, 40% (v/v) 95% ethyl alcohol and 10% (v/v) glacial acetic acid and then destained for 3 min destaining solution containing 40% (v/v) 95% ethyl alcohol and 10% (v/v) glacial acetic acid. Finally, the gel’s image acquisition and analysis were performed using Molecular Imager Gel Doc XR+. Here we used two different kinds of denaturation buffers: 1. 20 mmol/L Tris-HCl, 8 mol/L urea and 1 mmol/L EDTA, pH 8.0; 2. 5 mmol/L sodium phosphate, 8 mol/L urea and 1 mmol/L EDTA, pH 6.1. The recombinant proteins PlyCA and PlyCB expressed as inclusion bodies were incubated in different denaturation buffers for 1 h at 25°C, and then analysed by SDS-PAGE and Coomassie Brilliant Blue method to determine their concentrations. Mixed the the PlyCA and PlyCB denatured by buffer 2 with the ratio of 1:8 and obtained a final protein concentration of 200 μg/ml. Then the denatured protein was diluted with refolding buffers (5 mmol/L sodium phosphate, 1 mmol/L EDTA, 2 mmol/L GSH, 0.2 mmol/L GSSG, pH 6.1, with gradually decreased urea concentration from 6 mol/L to 0 mol/L). The protein was incubated in the refolding buffer at 4°C. After renaturation, the protein was concentrated with ultrafiltration. Several different kinds of renaturation buffers were tested to determine an optimized condition for refolding by dialysis (Table 2). Table 2. Several different kinds of renaturation solutions. Mixed the PlyCA and PlyCB denatured by buffer 1 with the ratio of 1:8 and diluted with the same buffer to obtain a final protein concentration of 50 μg/ml. Then they were loaded into dialysis bags having membrane molecular weight cut-off of 3 kDa. Renaturation of each solution was then carried out using a systematic renaturation device according to the method of Maeda et al. . Aliquots of the inclusion bodies were dialyzed against 100 ml of the renaturation buffers containing 8 mol/L urea with stirring. The urea concentrations of the dialyzing bottles were diluted with 900 ml of different renaturation buffers at a flow rate of 0.1 ml/min by peristaltic pump at 4°C. Mixed the PlyCA and PlyCB denatured by buffer 2, and dialysis with PB buffers with the same method mentioned above. Turbidity reduction and plate count assay to evaluate activity: Streptococcus pyogenes were grown in blood agar plate at 37°C for 2 d. The cells were harvested by washing with proper enzyme buffer to a final OD600 of approximately 0.5. Aliquots of PlyC was added to 500 μL of the bacterial suspension in tube to a final concentration of 20 μg/ml. Enzyme activity was expressed as the percent decrease in the turbidity of the bacterial suspension. As the detection of OD600 numerical no longer fall, coated the sample on blood agar plate, incubated at 37°C for 2 d, observed and counted the colony growth, with only PB buffer bacteria liquid as a control. All experiments were performed in triplicate, and control experiments were performed with the addition of enzyme buffer under the same condition. The effects of pH and temperature on PlyC activity were determined in 5 mmol/L PB buffers in a range of pH and a range of temperatures. The appropriate pH and temperature were used for further testing, bacterial suspension in 5 mmol/L PB buffer without PlyC as a control . Likewise, the activities of PlyC refolded by different ways were compared. Then plated 100 μL of each samples and incubated for enumeration after 48 h at 37°C. A buffer control was also included for comparison. Samples were observed at X1000 with Leica (DMLB2) microscope. For Scanning Electron Microscopy (SEM) and Transmission Electron Microscopy (TEM), the samples were prepared and processed following standard procedures by the Electron Microscopy Service in Zhejiang University. Scanning electron microscopy-Double fixation: The specimen was fixed with 2.5% glutaraldehyde in phosphate buffer (pH 7.0) firstly for more than 4 h; washed three times in the phosphate buffer, once for 15 min; then post-fixed with 1% OsO4 in phosphate buffer (pH 7.0) for 1 h and washed three times in the phosphate buffer. Dehydration: The specimen was first dehydrated by a graded series of ethanol (50%, 70%, 80%, 90%, 95% and 100%) for about 15 min at each step, transferred to the mixture of alcohol and iso-amyl acetate (v:v=1:1) for about 30 min. Then transferred to pure iso-amyl acetate for about 1 h. Finally, the specimen was dehydrated in Hitachi Model HCP-2 critical point dryer with liquid CO2. Coating and observation: The dehydrated specimen was coated with gold-palladium and observed in Philips Model XL30 E SEM. Transmission electron microscopy-Double fixation: The specimen was fixed with 2.5% glutaraldehyde in phosphate buffer (pH 7.0) firstly for more than 4 h; washed three times in the phosphate buffer, once for 15 min; then post-fixed with 1% OsO4 in phosphate buffer (pH 7.0) for 1 h and washed three times in the phosphate buffer. Dehydration: The specimen was first dehydrated by a graded series of ethanol (50%, 70%, 80%, 90%, 95% and 100%) for about 15 min at each step, transferred to absolute acetone for 20 min. Infiltration: The specimen was placed in 1:1 mixture of absolute acetone and the final Spurr resin mixture for 1 h at room temperature, then transferred to 1:3 mixture of absolute acetone and the final resin mixture for 3 h and to final Spurr resin mixture for overnight. Embedding and ultrathin sectioning: Specimen was placed in capsules contained embedding medium and heated at 70°C for about 9 h. The specimen sections were stained by uranyl acetate and alkaline lead citrate for 15 min respectively and observed in TEM of Model JEM-1230. Data comparing the activity of the recombinant PlyC under different conditions were analysed by one-way analysis of variance, then means separated by T-test. The activity of the PlyC in plate count assay was analysed by one-tailed paired Ttest comparing final viable CFU count resulting after exposure to PlyC or buffer control. The PlyCA and PlyCB expression and preliminary purification of inclusion bodies, detected by SDS-PAGE, were shown in Figures 1 and 2. The weight of PlyCA was 50 kD and PlyCB was 8 kD. Afterwards, the inclusion bodies should be washed four times by detergent buffer (pH 8.0). Auto-analysed and calculated by Molecular Imager Gel Doc XR+, the purity of PlyCA and PlyCB could attain 93.2% and 98.8%, respectively. Figure 1: SDS-PAGE of preliminary purification of inclusion bodies of PlyCA. M: Marker; 1: total bacterial culture; 2~5: inclusion bodies washed by once, twice, third and fourth times. Figure 2: SDS-PAGE of preliminary purification of inclusion bodies of PlyCB. M: Marker; 1: total bacterial culture; 2~5: inclusion bodies washed by once, twice, third and fourth times. PlyC activity against Streptococcus in 5 mmol/L PB buffers with pH values between 2 and 12 was tested in viability and optical density assays that proceeded for 0.5 h. The percent decrease in optical density at 600 nm was plotted. The activity of PlyC at various pH levels was presented in Figure 3, the optimum pH for this enzyme was 7.0. 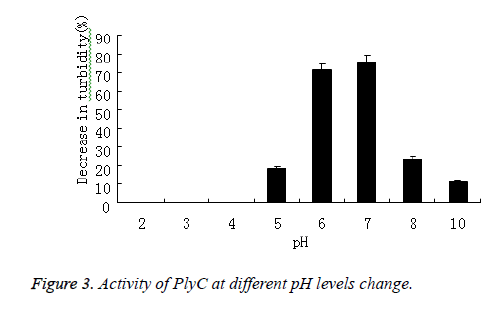 Figure 3: Activity of PlyC at different pH levels change. Likewise, the activity of PlyC at different temperature (25, 30, 37, 40 and 45°C) was also tested by percentage of decrease in the turbidity of bacteria suspension. The PlyC activity was observed at broad temperature of 25~45°C(Figure 4). The optimum temperature of PlyC was found to be 40°C. 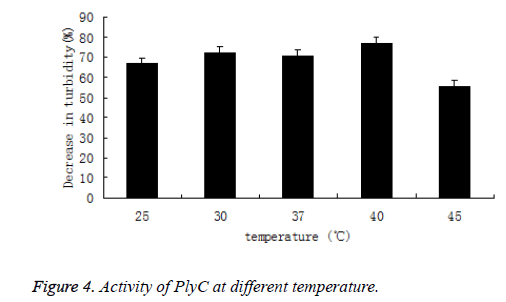 Figure 4: Activity of PlyC at different temperature. As comparison, turbidity of Streptococcus in 5 mmol/L PB buffers without PlyC didn’t decrease during pH and temperature varied. Inclusion bodies were solubilized in the above-mentioned buffers, containing 8 mol/L urea at a protein concentration of 50 μg/ml, and were either dialyzed overnight against 10 vol of different buffers or diluted 10 times with PB buffer. Although dialysis is a highly buffer-consuming and slow process, it’s clearly the better method for renaturation. The enzyme recovery of PlyC was about 84.6% high in the case of dialysis. But it’s clear that dilution refolding was the more efficient method and would be favoured over dialysis for future largescale refolding of recombinantly-derived PlyC. Phase-contrast and electron microscopy were used to visualize the lytic effect on Streptococcus. Normally, intact Streptococcus form chains, as shown in the buffer control (Figure 5a). After treatment with lysin, the cells lost their cytoplasmic contents and became filamentous by light microscopy (Figure 5b). As seen by electron microscopy, a weakness in the cell wall produced by PlyC results in extrusions and rupture (Figure 6a). Subsequent loss of cytoplasmic contents transforms the cells into empty “cell ghosts” (Figure 6b). 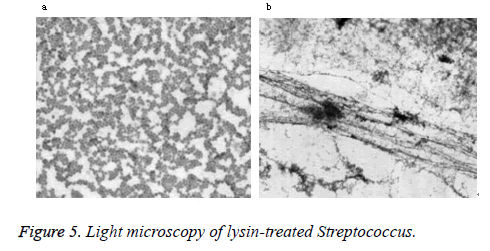 Figure 5: Light microscopy of lysin-treated Streptococcus. Figure 6: Electron microscopy of lysin-treated Streptococcus. 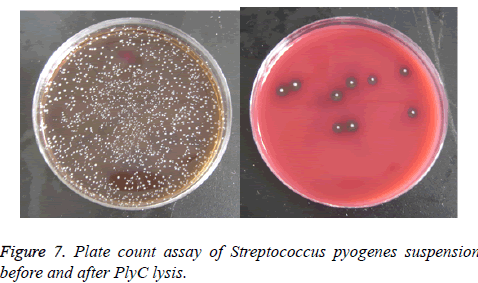 Figure 7 displayed the results of plate count assay of Streptococcus pyogenes suspension before (Figure 7a) and after (Figure 7b) lysed by PlyC. Coated on the blood agar plate and incubated at 37°C for 2 d, data showed the germicidal effect of PlyC was up to 99.6%. Figure 7: Plate count assay of Streptococcus pyogenes suspension before and after PlyC lysis. Lysins were used as topical antibacterial agents and proved to be highly effective. Since they very rapid and potent antibacterial activity both in vitro and in vivo, they could be a novel class of antibacterial agents . To our knowledge, the conventional method for lysins preparation was based on host bacteria and phage cultivation, obviously it had some deficiencies, such as complex process, some security issues and relative expensive. It’s not suitable for mass production. To achieve the purpose of efficient lysin preparation, in recent years, some researchers focused on the study of recombinant lysin expressed in E. coli and made some progress . However, lysins expressed in E. coli were mostly presented as inclusion bodies, so the refolding process of recombinant lysin was very important for its application, especially for PlyC, which was composed of two distinct subunits. Mostly, renaturation were relied on dialysis and it was not suitable for scale-up production. In this study, renaturation by dilution and dialysis were compared, and an efficient dilution refolding method for recombinantly-derived PlyC renaturation was set up. This finding laid the foundation for the further study and achieving an effective treatment for streptococcal infection. Research shows that dialysis by gentle removal of urea against 5 mmol/L sodium phosphate buffer (pH 6.1) with redox agents, protein concentration of 50 μg/ml and temperature of 4°C was found to be optimal. The refolding of PlyC to a soluble state was successfully achieved at a high yield of 84.6%, higher than the refolding yield obtained by dialysis. But dilution refolding is the more efficient method and will be favoured over dialysis for future large-scale refolding. The maximum enzyme activity was observed at pH 7.0, 40°C. The results showed that the renatured PlyC could efficiently cleavage Streptococcus pyogenes (group A β-hemolytic streptococci). Financial support by the Science and Technology Planning Project of Zhejiang Province, China (No. 2007C33002) and the Funding for Key Disciplines in Zhejiang province, China (No. ZJGK201280) is gratefully acknowledged. The authors want to thanks Xiao-Feng Wang, Yuan-Yuan Chen and Xu Chen for their technical assistants. Jacobs MR. Streptococcus pneumoniae: epidemiology and patterns of resistance. Am J Med 2004; 117: 3-15. Fischetti VA. Bacteriophage lytic enzymes: novel anti-infectives. Trends Microbiol 2005; 13: 491-496. Lopez R, Garcia E, Garcia P. Enzymes for anti-infective therapy: phage lysins. Drug Discov Today Therap Strat 2004; 1: 469-474. Nelson D, Schuch R, Chahales P. PlyC: A multimeric bacteriophage lysine. Proc Natl Acad Sci USA 2006; 103: 10765-10770. Koller T, Nelson D, Nakata M, Kreutzer M, Fischetti VA, Glocker MO, Podbielski A, Kreikemeyer B. PlyC, a novel bacteriophage lysin for compartment-dependent proteomics of group A streptococci. Proteomics 2008; 8: 140-148. McGowan S, Buckle AM, Mitchell MS, Hoopes JT, Gallagher DT, Heselpoth RD, Shen Y, Reboul CF, Law RHP, Fischetti VA, Whisstock JC, Nelson D. X-ray crystal structure of the streptococcal speciﬁc phage lysin PlyC. PNAS 2012; 109: 12752-12757. Chen WQ, Wang XF, Wang P, Zhang DY, Chen H, Ke W, Lu Y, Zhang JF. Expression, purification and activity identification of bacteriophage lysin of Streptococcus in Escherichia coli. Chin J Biotechnol 2009; 25: 1267-1272. Gong PS, Luo GM. Recent progress in renaturation of inclusion body. Chin Biotechnol 2003; 23: 73-78. Alois J, Waltraud K. Current status of technical protein refolding. J Biotechnol 2007; 128: 587-596. Fang M, Huang HL. Advances in vitro refolding of inclusion body proteins. Chin J Biotech 2001; 17: 608-612. Maeda Y, Koga H, Yamada H, Ueda T, Imoto, T. Effective renaturatiton of reduced lysozyme by gentle removal of urea. Protein Eng 1995; 8: 201-205. Celia LK, Nelson D, Kerra DE. Characterization of a bacteriophage lysin (Ply700) from Streptococcus uberis. Vet Microbiol 2008; 130: 107-117. Lood R, Raz A, Molina H, Euler CW, Fischetti VA. A highly active and negatively charged Streptococcus pyogenes lysin with a rare D-alanyl-L-alanine endopeptidase activity protects mice against streptococcal bacteremia. Antimicrob Agents Chemother (United States) 2014; 58: 3073-3084. Pohane AA, Joshi H, Jain V. Molecular dissection of phage endolysin: an interdomain interaction confers host specificity in Lysin A of Mycobacterium phage D29. J Biol Chem 2014; 289: 12085-12095.